• One individual membership for GSA staff members, for every $100 paid in year-­‐round membership fees. • Memberships can also be extended to reserving seats in any of our annual certification trainings to increase staff/board participation in the program. 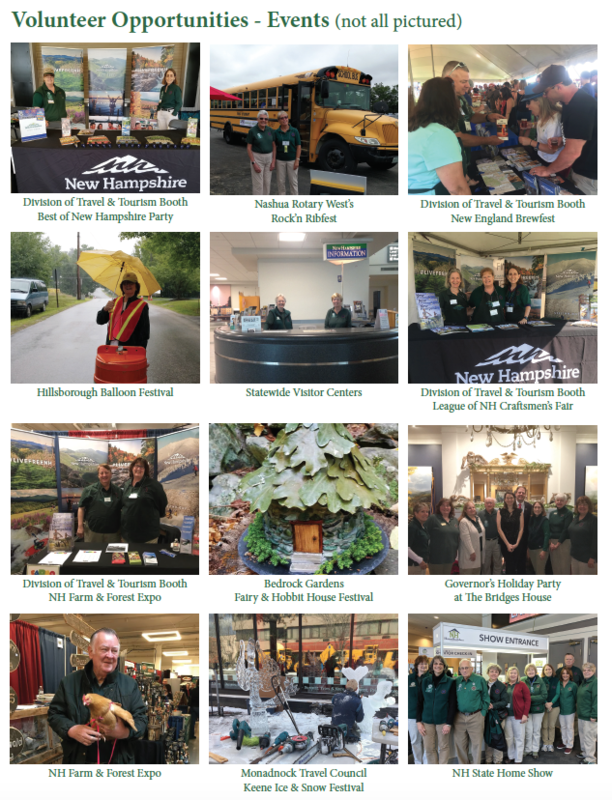 Secondarily to staffing visitor centers, NH Granite State Ambassadors also provide hospitality services at special events. 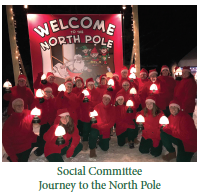 Volunteer services include meeting, greeting and interacting with event guests about New Hampshire tourism including tourism services and destinations. Other activities could include ticketing, registration, directional services, as well as, information and support for vendors. 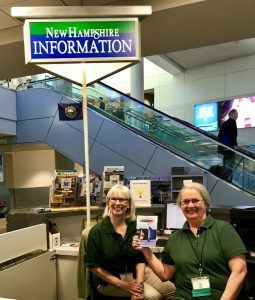 NH Granite State Ambassador staff services include recruiting, management and training of volunteers who will serve at each event. If the services of a GSA staff volunteer manager is not required for your event, we can also work with you and your own volunteer coordinator for a reduced rate. Events hosted by or supported by our key partners and members are the first consideration. Events hosted by organizations other than those listed above must be not-for-profit organizations or utilize our GSAs as “added value” support for staff rather than replacement of staff. Events must be tourism related, hosted in or related to New Hampshire. 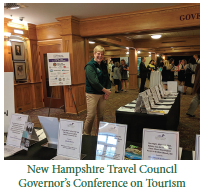 Events must be open to the public and provide guests visiting New Hampshire and the Granite State Ambassadors with knowledge about tourism related businesses, New Hampshire’s culture, history, and lifestyle, as well as, encouraging people to support NH Made Products and Services. Applications should include an outline of the event including date(s), event type, support needed, and address the above-mentioned criteria. Forward the outline to kelly@nhgsa.com for consideration. If you have further questions please call Kelly Bryer, Executive Director at 603-960-0272. 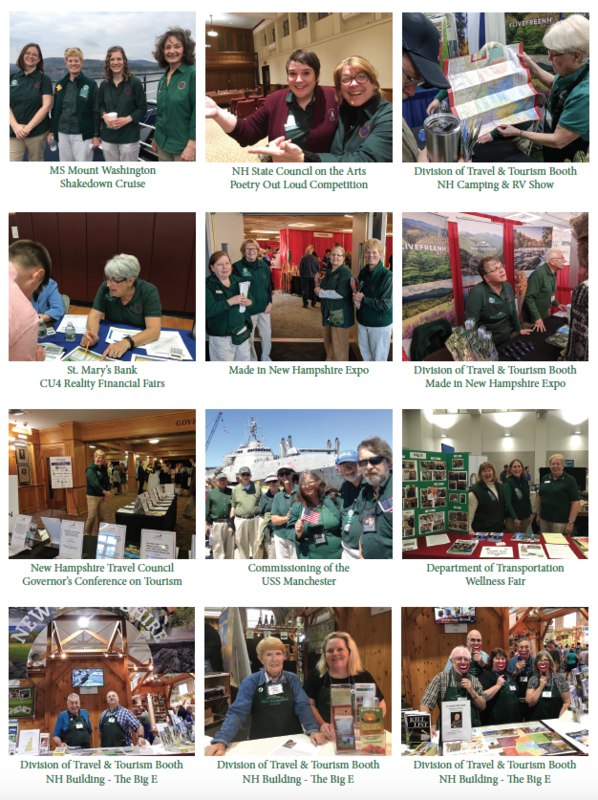 Examples include the NH Farm & Forest Expo, NH Home Show, and the NH Made Expo. We provide a GSA volunteer manager who works with the event’s manager to determine what types of positions need to be filled, how many people are needed, and for what time duration. 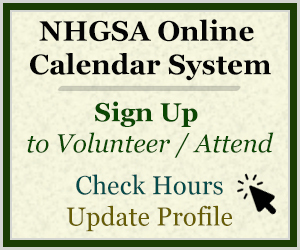 With this information, our GSA volunteer manager presents the volunteer opportunity to our certified GSA volunteers, schedules shifts, sends reminders, provides onsite training and management, provides event reports. Benefits listed above in Welcome Center Services. 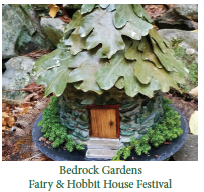 Examples include Bedrock Gardens, Strawbery Banke and the Hillsborough Chamber. We present our GSAs with opportunities to volunteer for another organization’s events and we provide a reporting of hours served by GSAs. We do not provide an event manager or volunteer coordinator. The Event’s Organization handles all communication, scheduling, reminders, trainings and management in it’s entirety. The Event’s Organization has the option of using their own scheduling tools or using our online calendar system (Volgistics). Benefits listed above in Welcome Center Services. On occasion we choose charitable events to participate in. An example is Believe in Book’s Journey to the North Pole event.